An estimated 6,000 women die in child birth each year in Uganda. Imaging the World is committed to lowering this number with ultrasound imaging, an important tool that can help ensure pregnant women get the prenatal care they need. We’ve developed a sustainable model for ultrasound imaging in the world’s poorest regions. Our work is to make basic, life-saving diagnosis available in rural hospitals, particularly for maternal care. 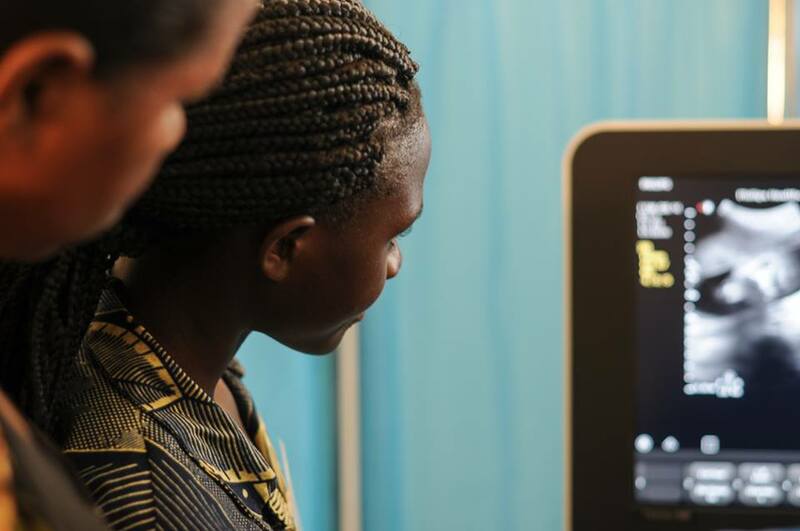 Imaging the World (ITW) integrates low-cost ultrasound programs into remote health care facilities that often lack radiologists and other skilled personnel, not to mention imaging equipment. Our approach combines point-of-care ultrasound devices, proprietary software, training, supervision, and continuing professional development together with community awareness and funding models that promote self-sufficiency. We also take cultural and political factors into account, as well as healthcare access and other socioeconomic constraints. The first ITW ultrasound site was established in Uganda in 2010 by Imaging the World Africa, an NGO registered in Uganda and affiliated with our US organization. Since then, our activities have grown to eight sites throughout rural Uganda. Although the Ugandan ultrasound program was started to identify high-risk pregnancies, it has since expanded to detection of breast cancer, evaluation of liver, kidney and thyroid disease, pediatric diseases, trauma triage, and echocardiography for rheumatic heart disease. One of our major accomplishments has been the development of new software, called VICAT, which can transmit entire ultrasound scans over the internet. This allows scans to be reviewed remotely with the same image quality as seen by the onsite technician who is with the patient. With this software, any rural clinic with a cell phone signal can have images interpreted remotely, either for training or diagnostic purposes. Initially, the ITW transmission software was at the core of the Ugandan program. Low-level health care workers could be quickly trained to generate and transmit ultrasound sweeps of pregnant women and the images could be interpreted elsewhere. Now, ITW’s training programs are enabling clinics and hospitals to move towards self-sufficiency. Newly trained medical personnel provide onsite readings without the need to send scans out for interpretation. To-date over 150 clinical officers, nurses, and midwives have been trained by Imaging the World Africa to produce high-quality obstetric scans at the point of care. Eight of the trainees have become full sonographers and are now trainers in the program, underscoring the sustainability of the model. The VICAT software is still essential to our program, but scans are not routinely read remotely any longer. Rather, the software enables remote scans to be used for quality assurance, training, and readings of difficult cases. In addition to implementing and consulting on imaging systems, Imaging the World serves as a gateway for research and educational opportunities. We work with outside organizations as an advisor or sub-contractor, while also conducting our own research. Our research has resulted in 11 peer-reviewed publications and 23 national and international presentations. We offer two annual trips to Uganda for students and medical professionals to learn about imaging in under-served areas and explore research opportunities. Additionally, in collaboration with The University of Vermont’s Larner College of Medicine, Imaging the World sponsors an International Radiology Elective Rotation for medical students. A turnkey package of services for establishing low-cost, high-quality ultrasound programs that addresses the unique needs of low- and middle-income countries and remote areas of the world. Proprietary software for transmitting high-quality ultrasound images from rural outposts via the internet to anywhere in the world. Expertise in implementation of sustainable and scalable health programs in rural locations in Africa. Training programs to fit the unique needs of rural health care systems. Ongoing technical support for imaging programs established using our model. Consultation for ultrasound device procurement, matching the needs of the user with the appropriate system. Consultation on funding models for imaging programs in rural areas. Hosting educational, research and volunteer abroad programs in areas where the Imaging the World model is implemented. International Radiology Elective Rotation sponsor. Support of research through access to data and infrastructure in the areas where Imaging the World has established imaging programs. Grants administration for research in areas where the Imaging the World model is functioning. We continuously strive to make ultrasound services available around the world. We are consulting on ultrasound program implementations with government and organizational representatives from Democratic Republic of the Congo, Mozambique, Malawi, Namibia and Swaziland. We have a pending NGO registration in Malawi to partner in ultrasound programs.